An automatic watch winder for 6 watches , LCD touchscreen control, LED backlight and remote control unit by Paul Design. Maximum watch diameter: 2.6 inches. Only use the adaptor supplied with this watch winder. ALWAYS turn off the power before inserting or taking out watches. Unplug the adaptor when the watch winder is not being used. DO NOT rotate the winder turntable at any time. DO NOT place the watch winder in direct sunlight or in environments that are either damp or dusty. 8. 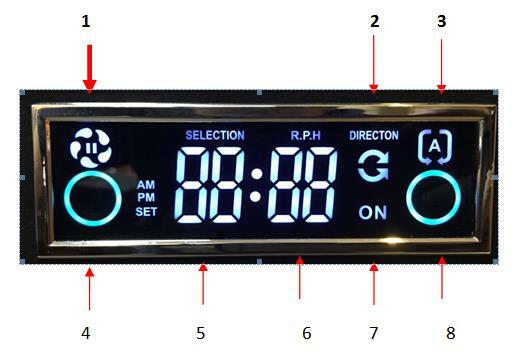 Automatic mode button – Automatic mode：default setting (36 rotations per hour；both directions) to winder all the watches, this mode is suitable for most of the watches.